With an exhibition looming, and a friend in Melbourne artistically inclined, I felt a trip to some of Eastern Australia’s most beguiling rock formations was well and truly overdue. 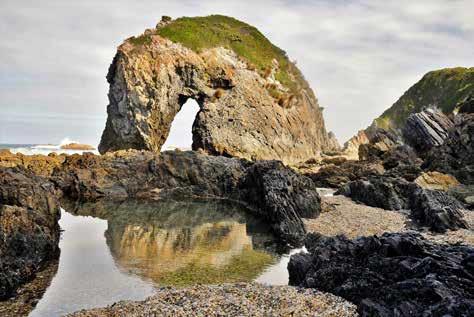 I started my trip alone with a drive south to Bermagui, NSW, to do some fishing and view Horse Head Rock, a little known feature that was nearby with tricky access. 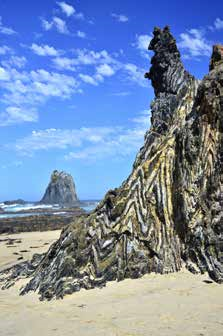 It was at the back of Camel Rock, and only accessible at low tide. I parked at the Camel Rock car park, loaded my camera, and walked into the unknown, up a slightly worn track to the top of the headland. Others had passed before and when I reached a patch of windblown heathland I was glad they had, as the going would have been nearly impossible otherwise. It cleared, I gazed down from an impromptu lookout. No Horse Head Rock. Walking further I could make out the cleavage, but it looked nothing like I’d seen two years ago at Mogo in a photographer’s gallery. Now I’d found the rock, I pondered on what the best route to the beach might be. Both ends were protected by rocks, one a broken headland, the other? A formidable obstacle. Choosing to go to the seemingly more difficult northern end on the basis that I would then be working backwards, I apprehensively strolled off. The scenery was making the whole experience worthwhile. A cool breeze flexed the headland grasses and as I neared the end, things suddenly seemed a whole lot harder. A narrow razorback strip rose to where I was standing and I studied it at length. I figured my traditional one-step-at-a-time progress might work here, so I carefully edged forward. It was steep and dangerous, but I’d done stuff like this many times before and was very careful. It was time to edge over the cliff. Dusting off my pants when I reached the base, I stepped out along the smooth sands backed by the cliffs I’d just walked across. All alone, with the wave wash echoing off the cliff walls, my sense of being at one with nature heightened. Excitement mounted as I neared the hoped-for gap, but there was joy in the journey, too, it’s such a pretty place. Then the hole appeared, slowly and beguilingly it draws you in, totally changing the appearance of Horse Head into what its name suggests. Somehow, the fact that there’s sky in the middle of the rock makes it so much more appealing. The camera has its moment here, recording the angles and variations of the theme, particularly the reflection in a rock pool that would soon be gone with the coming of the tide. I moved around to the south, and saw the near-vertical geological uplifting in the layered strata capped with hardy grasses and plants, whose roots probed the gaps, eking out a much-weathered life. Beyond, I could at last ascertain the common route from the south, it followed the shattered headland and was definitely not to be taken at high tide. I chose to return via the way I’d come, and climbing out proved easier than descending, provided you didn’t look down! I camped with still a day up my sleeve and tried my hand at fishing (two fish, no keepers) and golf (a lovely course wasted on me). The next day, after testing out my neutral density filter at Beares Beach, I packed up and headed for Victoria’s Bass Coast. I like Inverloch. I’ve only been there once before, but sometimes a place just settles easy on you and brings a warm feeling whenever you think about returning. Thus it was, I decided to spend a night there, parking beside a walk/ride path used by the healthy set. Beyond the dunes cloaked with brushy vegetation lay an inlet where fishing was a prominent activity and photographers would seek sunrise and sunsets. Its calm appeal wafts over you, instilling a sense that all is well in the world as you saddle up and drive away. I was headed to Phillip Island, at last, and had chosen the southern-most route through Wonthaggi, wondering if there was anything worthwhile at Cape Paterson en route. The western end of Gippsland is usually lush, but the toll of climate change had rendered the scenery almost harrowing in some places. Only near the ocean were green patches to be seen. 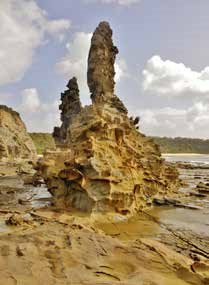 As I sidled along the line of cliffs, I realised Bunurong Marine and Coastal Park had something to offer. Prominence after prominence jutted out into the ocean, and occasional rock shelves in lieu of beaches appeared with the waning tide. I paused at one and alighted, taking the stairs to the beach below. As I rock hopped towards the point, differing vistas unfolded until, beyond the point, the holy grail of my search. Some other tourists were also coming out and I almost shouted at them in excitement that Eagles Nest was on the next headland. With the little accumulated knowledge I’d assumed it was unattainable, but at least I could see it, albeit from a way off. It’s a rock formation of stand-out geography with as many faces as angles. I stumbled back quickly to the motorhome, ascending the stairs like an urgent 5-year-old and headed west. Lo and behold there was a lookout from where you had a nice overview and, whilst taking in the panorama, I noted a staircase to the beach. There were two other vehicles there but, apparently, the occupants were merely interested in viewing the formation from the lookout at the point. I couldn’t believe my luck at (a) finding the rock, and (b) being able to descend on to the platform that supported it. There are platforms here because the coastline is sheltered to a large degree from the destructive sou’ westerly swells by the distant King Island. Thus, a different shoreline is apparent and it supports a variety of marine vegetation and animal life, 90 per cent of which is found nowhere else on earth. Into this surreal world I wandered, checking the rock pools occasionally on the semi-tessellated shelf but ever focused on the lonely outcrop drawing me ever closer. Its ragged edges told of hardship and violence but it remains steadfast in defiance. Getting nearer provides differing viewpoints; the outline changes dramatically with every passing degree. Even looking back at the cape is interesting as the clouds, in their ever changing mode, drift past on high. With cards full of images, and tales to tale, I collected my travelling companion Lorraine Parker in Melbourne, with the view to return to the NSW Coast. You can’t leisurely travel the South Coast without stopping at Central Tilba, so this time, we headed off there for some cheese, after tasting of course, before reaching Narooma. Our next stop was the seafood platter in Narooma, which as always, was a highlight for us. You get it by contacting the seafood place on the northern end of the bridge and, for $50, you’ll get bugs, scallops, a dozen oysters, crunchy fresh prawns and a few other items. Absolutely scrumptious. 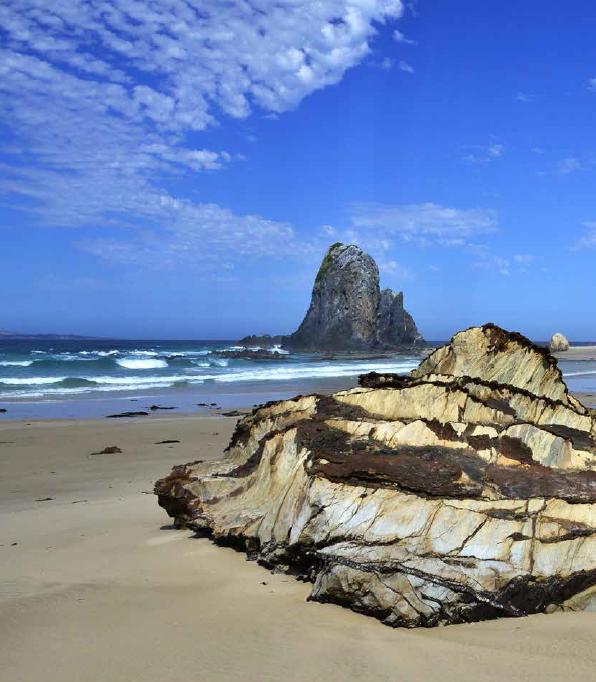 We were on our way to Glasshouse Rocks, Lorraine had read a 5 star-review on it on TripAdvisor. Funny, we’d never heard of it; time to go and have a look. Apparently, the cemetery was the place to aim for, though there is a sign “Glasshouse Rocks Lookout” on the Princes Highway. The road is scenic in its own right and not too far to the lookout. As the report indicated, the view is pleasant, but it doesn’t prepare you for what’s in store later. We located the small white fence around the furthest graveyard and filtered our way down on the middle of three tracks where they separated. Beneath a spreading gum tree, a path takes you to the beach. It’s the only legal entry to the place, as all land beyond is private property, mainly owned by Justin Hemmes of the House of Merivale. The first surprise is the chevrons. Where rock layers have been put under immense pressure they’ve buckled severely, scrunched into acute wavy angles of different coloured layers; quite extraordinary. As you head south, you’ll find all manner of types of geology here and there, literally a result of a “blast from the past” some hundreds of millions of years ago. I know it’s a big claim but, speaking from a personal point of view, I rate this better than the 12 Apostles on the Great Ocean Road. Why? I hear you ask. Well, for a start there are no helicopters flying by, you are as one with nature, soaking up the solitude of the venue and, most important, the formations and types of rock are all so different. With every few paces, the viewpoint changes dramatically, providing lots of photo opportunities and you can walk among the rocks, with low tide offering the best chance get up close and personal. Reluctantly, we moved on finding ourselves much later at Malua Bay, a gorgeous haven on the coast out from Batemans Bay, parallel with Mogo, which inspired our journey. We spent the night here and, very early on the morrow I rock hopped out to the point and was surprised at the colour in the rocks. A lava outflow had once settled among the abundant sandstone, creating a dramatic shift from black to almost white in the rock. 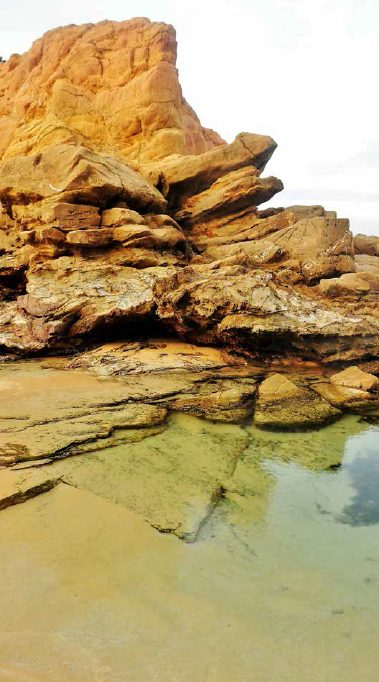 Jagged-edged rock pools were full of Neptune’s necklace providing not only shelter for animals, but a mottled yellow appearance. It served as yet another reminder to me that you should never take travel for granted. In my experience, there’s always something within easy reach of some interest, just keep your mind open and you, too, might unearth something special. GETTING THERE - Beares Beach is 102km south of Batemans Bay, NSW - Bunurong Marine and Coastal Park is 145km south-east of Melbourne, VIC - Narooma is 72km south of Batemans Bay, NSW MORE INFO - Visit www.sapphirecoast.com.au for more on Horse Head Rock and Beares Beach on the Sapphire Coast, NSW. 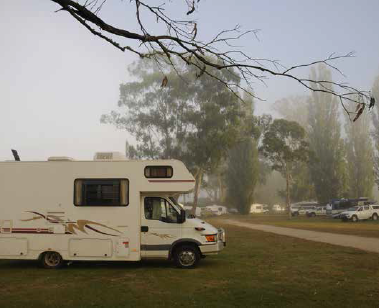 - Visit www.travelvictoria.com.au for more on Inverloch, VIC, and parkweb. 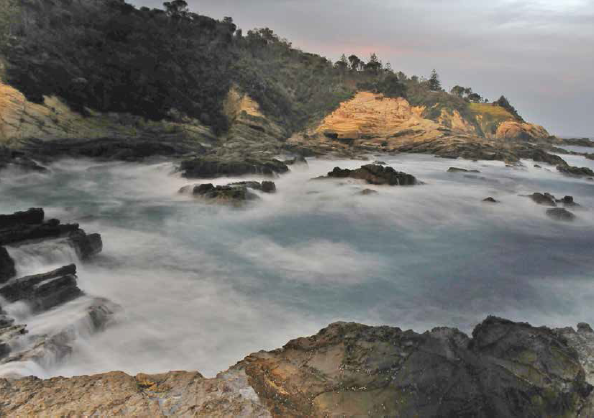 vic.gov.au for more on the Bunurong Marine and Coastal Park. 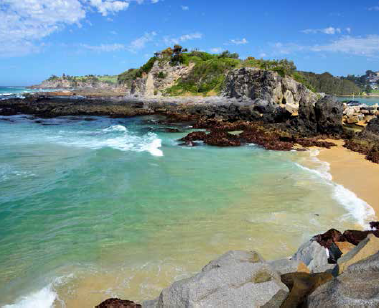 - Visit www.eurobodalla.com.au for more on Glasshouse Rocks 5, Narooma and Batemans Bay.